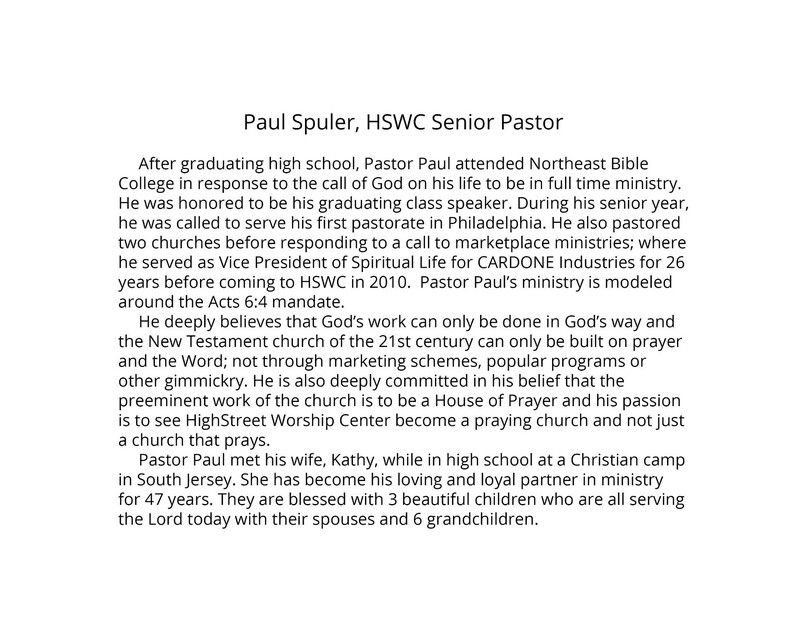 After graduating high school, Pastor Paul attended Northeast Bible College in response to the call of God on his life to be in full time ministry. He was honored to be his graduating class speaker. During his senior year, he was called to serve his first pastorate in Philadelphia. He also served in Medford, NJ before responding to a call to marketplace ministries, where he served as Vice President of Spiritual Life for CARDONE Industries for 26 years before coming to HSWC in 2010. Pastor Paul’s ministry is modeled around the Acts 6:4 mandate. ​​He deeply believes that God’s work can only be done in God’s way and the New Testament church of the 21st century can only be built on prayer and the Word; not through marketing schemes, popular programs or other gimmickry. He is also deeply committed in his belief that the preeminent work of the church is to be a House of Prayer and his passion is to see HighStreet Worship Center become a praying church and not just a church that prays. Pastor Paul met his wife, Kathy, while in high school at a Christian camp in South Jersey; and they were married in 1968. They are blessed with 3 children, who with their spouses and 6 beautiful grandchildren are all serving the Lord today.